A consuming mystery, a chilling puzzle, a riveting story line. Maddie manages to keep her twisted thoughts hidden for the most part. That is until she starts having blackouts. Each time she wakes up from one, she’s near a murder scene with no recollection of what happened the night before and this helpless feeling like she’s losing control of her life. Maddie doesn’t want to believe she’s a killer, but she begins to question who she really was in her past. If she was bad Maddie all along and that maybe she was a killer. This. Book. I was so consumed by it. Intrigued by it. There’s a reason I love mysteries and thrillers. I have an obsessive need to figure out puzzles.. and goodness, was this novel a puzzle! A mystery shrouded in secrets. In repressed memories. In flashes of violence and blood. I should mention it’s not a romance, it’s a dark psychological thriller about a girl who is haunted relentlessly by both a traumatic childhood and an ‘accident’ that left her bloodied and broken on the road without recollection of anything. Forgotten was her name. Forgotten was her past. Forgotten were the culprits behind her tormented life. Until something changes and her past and present collide more vehemently, forcing the two sides of herself to war over control. And when murders surround her, Maddie must figure out her past to see if she has blood on her hands. To see if she’s a killer. At fifteen years old, Maddie Asherford is found barely alive, an event that leaves her with amnesia. She doesn’t remember a thing, but as the years go by, memories… visions… plague her thoughts. She feels as if there are two sides to her, one who works to get better and another who is bad. Darker. It’s almost as if one side is victimized, struggling to make sense of everything, while another is stronger and more calculated… willing to do anything. Willing, no… wanting to kill. Urges to hurt others surge inside and Maddie must work hard to control those anarchistic and violent impulses that threaten her already fragile existence. In addition, she hears voices in her head. Screaming at her, taunting her that’s she’s bad. I couldn’t help but feel so heartbroken for her. It was a tortuous existence to live a life so divided, so blurred, so lost in everything that had been forgotten. One day Maddie has a blackout. She awakes alone with some blood on her arm. Two buttons in her pocket. Nearby, there’s a murder scene. One of her co-workers has been killed. A co-worker, who lay dead and covered in blood, wearing a shirt with a missing button. Maddie is physically sickened by what’s transpired and she wonders if she could have done it. Did the other side of herself take over? Did she have it in her to kill? Could she forget something so significant? And if so, was she truly responsible if she couldn’t remember a thing? Maddie’s life spins out of control. There are so many secrets to uncover. Someone had hurt her in the past. Was someone after her still? Framing her? Her thoughts are so broken, fragments holding memories that don’t quite fit together. She’s not sure what’s real and what’s not. Her mom knows something, but is determined to protect her. From whom? Herself? There’s a chilling sense to everything that unravels and as the reader, I found myself as confused as Maddie. I was trying so hard to put together all the puzzle pieces, but nothing was quite right without all the information. I kept getting that hair-raising, heart-pounding feeling, but the story was so ingeniously layered that I couldn’t figure it all out. The story felt dangerous and I couldn’t put it down. The truth was hiding. I wondered if in plain sight. 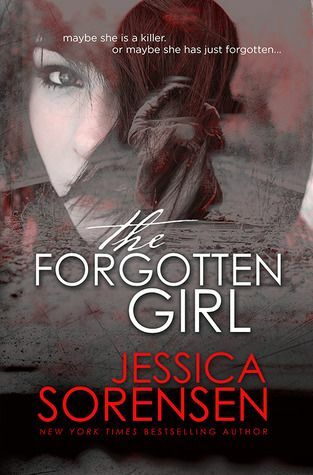 Jessica Sorensen had my mind in such a state that every character seemed like a possible culprit. I even wondered who was real and who was not. I loved everything about this story. How it made me feel. How it got me all tangled up. How the truth was elusive until the shocking end. Even then, I don’t know if it’s all clear in my muddied and over-worked brain. This is a really daring piece of work from the talented Jessica Sorensen. It’s heart-wrenching, disturbing, sad, suspenseful, chilling. There’s so much more to the story, but I dare not spoil any piece of it. I have to say I particularly loved the ending. It was blindsiding and shocking and perfect to the feel of the book. If you are a fan of tangled webs and hidden truths, of thrilling mysteries and complex characters, you won’t want to miss this page-turner of a novel. It’s a standalone, but admit, I could easily and enthusiastically devour another book on this girl.